As a part of a Multicultural Kid Blogs group, I have the opportunity to learn more about many different world cultures and religions. 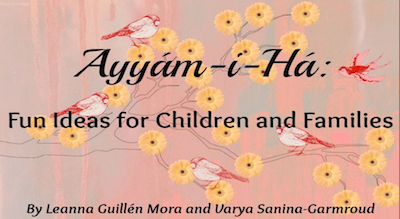 Recently two members, the voices behind All Done Monkey and Creative World Of Varya, published an for families in anticipation of the Bahá’í holiday of Ayyam-i-Ha which begins on February 26. I asked if I could share the book here because several of the activities are particularly good language learning ideas. The activities in the book are intended to cover a broad range of ages (2-11), but what they all have in common is that they are so doable. The crafts use materials we all have and the recipes are perfect for making with children. Of course, I was especially interested in the activities that have a significant language component because I think they would work well for children learning Spanish. I’ll mention two that I liked and will be trying with kids. The book gives instructions for a Countdown Activity Chain that would be an excellent way to do a Spanish language activity a day. It could be a countdown to a holiday or special event, or it could simply count the days of a month, with an activity for each day. One of the hardest parts of teaching children Spanish is constantly providing new and interesting input. An activity like this one makes it much easier! Another activity that I like for Spanish learners is the Virtue Tree. It is a way to help children learn and practice different important qualities, or virtudes. In the book, the tree is a countdown to the holiday but the activity can be adapted in many ways. The basic idea is that you make a paper tree and add the virtues by writing the word on a paper cutout of fruit and putting it on the tree. As you add it to the tree, you talk to kids about how you can practice that quality. There are English printables to make the tree in the e-book, and the authors were kind enough to let me translate the list of virtues to share with Spanish Playground readers. You could put them below the English words or make your own cutouts. This ebook has many other crafts and activities. If you are looking ahead for ways to celebrate spring, this is a good place to start. Thank you for your review! I love your ideas for using these activities to learn Spanish!